SYNOPSIS: Two hot shot police officers are marked for death by a drug cartel after they are part of several busts of guns, money, and human traffickers. REVIEW: David Ayer, writer of Training Day and S.W.A.T., graduates to writing/directing of his sophomore film with End of Watch. Gritty and raw, Ayer uses the documentary style Handicams, dashboard cruiser cams, and shaking handheld camerawork to delve into the workings of the life of two blue brothers in arms. Police officers and partners Brian Taylor (Jake Gyllenhaal, Source Code) and Mike Zavala (Michael Pena, Tower Heist) patrol the streets like black and white pushing armed cowboys. While Taylor takes Pre-Med courses, he takes an elective course in filmmaking, resulting in him bringing a camcorder and other small cameras on the job. Cleared of a good shoot earlier, Taylor and Zavala get back out on the streets, answering calls ranging from assaults on mailmen to missing kids to gangland politics. When a routine stakeout turns into a traffic stop that involves weapons fire and the seizure of money and guns, Taylor and Zavala find themselves in a much bigger situation involving a drug cartel, human trafficking, drugs, guns, gangs, and a price on their heads. David Ayer writes and directs a dramatic and realistic turn of two patrolling policemen who live and bleed blue for their brothers in arms while trying to maintain a life outside the force. Considered reckless cowboys on tour, Taylor and Zavala keep it light until they need to 'get the job done'. When out of uniform, Mike dotes on his high school sweetheart turned wife Gabby (Natalie Martinez, Death Race), while Brian trades in sleeping around for an intelligent, beautiful woman named Janet (Anna Kendrick, ParaNorman). At work or at play, the duo give it their intense best. While Taylor and Zavala seem to have it all at home - loving women, babies on the way - but they may be unprepared for what is piecing together during their tours on the job. A stakeout turned traffic stop reveals money and guns and additional intel that lead Taylor and Zavala deeper into illegal activities and organizations that more covert law enforcement agencies are circling. As Taylor and Zavala uncover more dire and twisted locations run by local gangsters, they come to the attention of a Mexican drug cartel who kingpin decides that the decorated pair have caused enough problems for their operations and puts a price on their heads. The acting is superb. Jake Gyllenhaal and Michael Pena work great together, making you believe that these guys have been working the job together and having each others' back as friends and partners for a long time. Natalie Martinez and Anna Kendrick, as Brian and Mike's domestic partners, anchor the duo and the story in the real world. Cody Horn (Magic Mike) and America Ferrera (Ugly Betty) make for unlikely squad car mates, showing that they are much tougher than people thought. Frank Grillo (The Grey), as the Sarge, has been playing law enforcement for a while and it shows. On the other end of the law, Maurice Compte (Breaking Bad) as 'Big Evil' and Yahira Garcia as La La show why men and women of the police forces of this nation should be commended at a dangerous and sometimes thankless job. 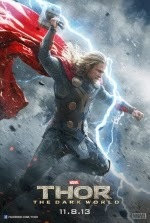 The film slowly builds to an intense gun blazing ending. Gyllenhaal, Pena and the rest of the cast do their utmost best to move the story along, but their best still doesn't keep the story from slowing down from time to time. When the story steers to matters not involving carrying a badge and a Glock 19, the story meanders a little too long before the partners get back on shift and to horrifying discoveries. But once the sirens blare and the call goes out on the radio, the pace quickens with the adrenalin rush of facing uncertain death. 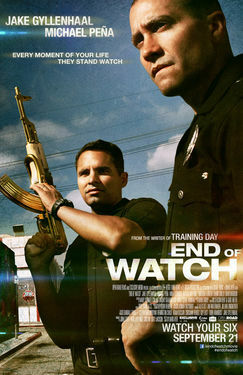 End of Watch is a rare flick that displays many facets of the life on the job and off. Equal parts domestic bliss, dull down-time between calls, and the sudden intensity of serving and protecting against unknown odds, this police drama shows heart, as well as violence.